Authors: A. D. Goulding, W.R. Forman, R.C. Hixkox et al. Astronomers now believe that all galaxies contain a black hole at their centre and the bigger the galaxy, the bigger the black hole. However, we still don’t know how many of these black holes are active. This activity is thought to have an extreme effect by using the galaxy’s own material as fuel and throwing out huge energetic jets; but how much of an imapact does this have on the galaxy? To answer these questions astronomers attempt to study populations of galaxies with active galactic nuclei (AGN) at all redshifts at many wavelengths (X-ray, optical, far-infrared, radio etc.) to observe both the optical stellar population and the jets simultaneously. 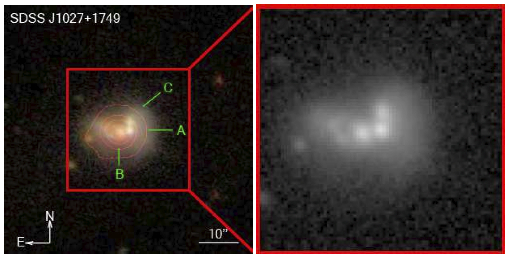 Originally this AGN activity was thought to be triggered by galaxy mergers which in turn produce powerful starbursts and possibly a change in the galaxy’s morphology (i.e it’s shape; e.g. from a disc galaxy to an elliptical). 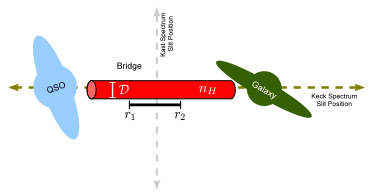 However, some of these previous multi-wavelength studies of AGN host galaxies have provided evidence that the majority of galaxy evolution due to AGN activity (galaxy-AGN co-evolution) is dominated by secular processes (slow, calm processes) as opposed to a galaxy mergers (relatively fast, violent processes which destroy disc and spiral arm structures). In order to study the effect of AGN on their host galaxies, the authors of this paper consider the distribution of the host galaxies out to a redshift of z = 1.4, which corresponds to a look-back time of ~ 9 Gyr (i.e. the light from the galaxies at z = 1.4 was emitted over 9 billion years ago and allows a comparison with maturer galaxies at z=0). They identify the AGN sources using radio , X-Ray and infrared (IR) wavelengths and match them to a host galaxy using an optical sample from various surveys; SDSS, Boötes and DEEP2 which have redshift ranges of 0.05 < z < 0.2, 0.2 < z < 0.7 and 0.7 < z < 1.4 respectively. This sample shows varying degrees of galaxy bimodality (two distinct populations) on the colour-magnitude diagram in each optical survey, as shown in figure 1 below. The “blue cloud” consisting of low mass, blue (and therefore star forming) galaxies is prominent at higher redshifts in the DEEP2 survey (right hand panels), whereas the “red sequence” (higher mass, red, quiescent) galaxies are more prominent in the lower redshift surveys. This shows the evolution of galaxies as they age and star formation begins to cease. Figure 1. 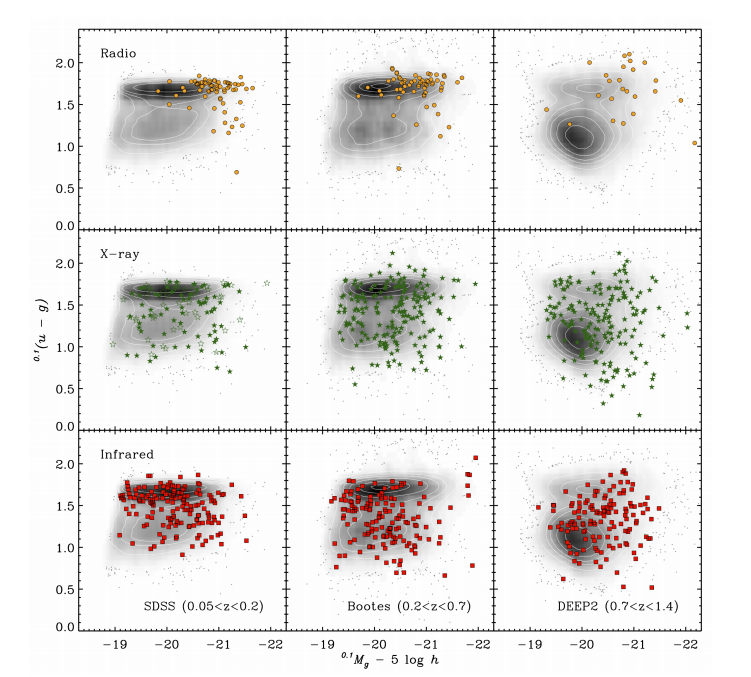 Optical colour-magnitude distribution of galaxies in the SDSS (left panel), Boötes (middle panel) and DEEP2 (right panel) surveys showing host galaxies of radio selected AGN (top panels), X-ray selected AGN (middle panels) and infrared selected AGN (bottom panels). Red, high mass galaxies are found in the top right corner of these plots: blue, low mass galaxies in the bottom left corner. Fig. 5 in Goulding et al. 2013. Figure 2. Schematic showing the evolution of AGN host galaxies across the last 9 Gyrs of cosmic time, according to the authors. Radiatively efficient (X-ray/IR AGN) accretion processes appear linked with those galaxies with large supplies of gas (leading to rapid black hole growth), whereas mechanically efficient (radio AGN) accretion processes are associated with passive host galaxies. Figure 7 from Goulding et al 2013. The authors argue that the above results are due to the distinctly different accretion processes that drive the activity of the black hole. 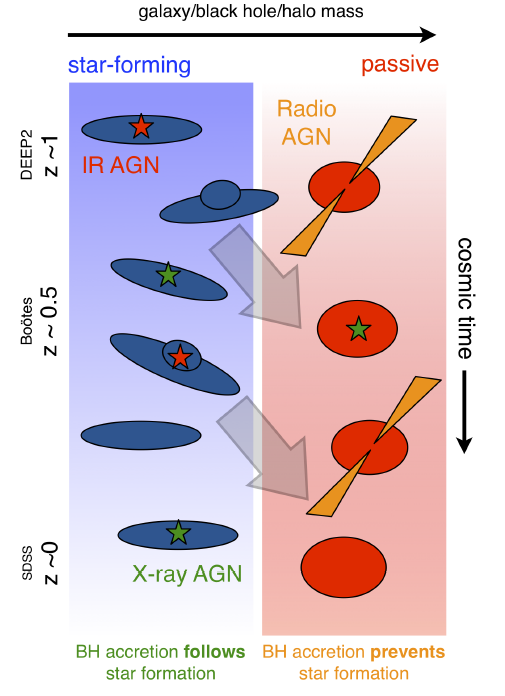 Whereas the radio luminous AGN are dominated by mechanically efficient processes (low excitation, massive black holes with massive old stellar population hosts providing little fuel), the X-ray/IR luminous AGN are driven by radiatively efficient processes (requiring ample cool gas to fuel higher accretion); suggesting that the triggering mechanism and fueling source are the same for radiatively efficient AGN. They present this picture of AGN evolution with a handy schematic shown in Figure 2. They also argue that since across all redshifts the host galaxies have similar distributions for those with X-ray/IR AGN (and since there is no statistical evidence to suggest that this is not the case for the radio galaxies) that the general properties of these AGN host galaxies have not changed over the past 9 Gyrs of cosmic time. This suggests a picture where AGN do not drive the evolution of their host galaxies; drastically different to either picture of merger or secular driven evolution discussed earlier. Finally, since there is also little systematic difference between the underlying general galaxy population and the host galaxies of X-ray AGN, the authors infer that X-ray AGN exist in all galaxy types. This lack of distinction between the two populations gives rise to the conclusion that at some point in cosmic time, a large majority of galaxies will have hosted an actively growing black hole, independent of host galaxy properties (e.g. merger history, luminosity, stellar mass or stellar population). With these conclusions laid bare, this suggests another mechanism is necessary to explain the quenching of star formation in order to account for galactic evolution across the colour-magnitude diagram with cosmic time*. *Want to help answer the outstanding questions? Get involved with Radio Galaxy Zoo!